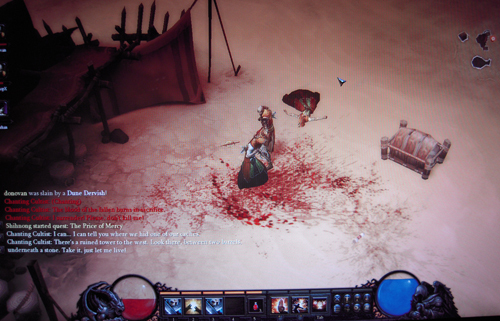 Diablo III is a hack n’ slash computer game continuing the story of Blizzard’s Diablo series. The gameplay trial takes place in Act II, which was another desert area (remember Diablo II Act II?). Diablo III uses very few button for actual gameplay mechanics. Keys 1-5 are used for instant skills. 5 is used for potions, which I thought Blizzard removed but instead downplayed with large cooldowns. These skills for 1-4 are not targetable (so far as I’ve tried). They are instantly used upon your character’s location. The mouse is still your main mode of access to the game. Left clicking is your character’s normal attack (Monk disincluded). Right clicking is a special attack (usually consumes mana). There are two slots for right clicking, which can be alternated with the tab button. The health orbs dropped from enemies are scarce, and instead, health regeneration is added into the game. You still have to be careful with fighting though. When leveling, you still receive the talent choice, but there are no more stat choices. It’s a very streamlined system meant for all people to try. The inventory has been updated and holds more spots. Potions stack together in your inventory. On the character equipment sheet, two additional slots have been added: pauldrons and something in the bottom right corner, which was inaccessible during the gameplay trial. There is no more stamina/run bar, so you always move at the same speed (which is fast enough to get around places and slow enough to not run past your objective). Pretty but it wasn’t anything spectacular. Explosions and gore effects are really pretty looking. I only tried the Monk and the Witch Doctor because I’m assuming the other two are staples that haven’t really changed that much. The monks moves look really cool. His normal left click attack is an upgradeable 3-hit combo. On the 3rd hit, he hits with AoE (area of effect) damage and causes enemies to explode in a cloud of blood and gore. The monk has a channeling shield, which I used against a dervish (imagine a tornado) and died. Not the brightest idea on my part, but without the shield, the dervish knocks you back and you take less damage. He also has an AoE blind that causes enemies to miss. He has an additional combo for right clicking that hits more enemies for less damage. And his really cool ability was a flurry of punches where the Monk disappears from the map, making you immune to damage, and reappears around an enemy 7 times, striking them all over. If you miss right clicking an enemy with that, your monk just strikes air. It’s a long animation too – about 7 seconds, so your friends could kill all the enemies in that time. Summons zombie dogs and spiders. Throws explosive skulls. Fears the crap out of enemies by donning a giant spectral mask that scares them away. Hilarity. Never ran out of health. Almost always had Mana. 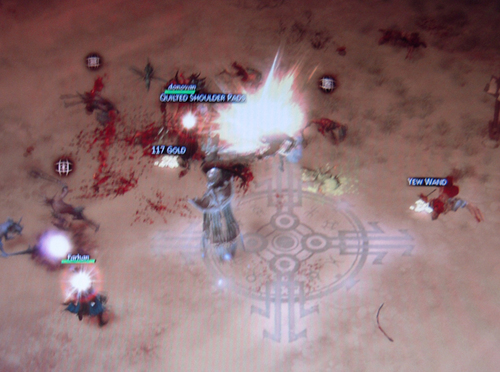 Diablo III is shaping quite nicely, but the Monk doesn’t seem to be that amazing of a class. From the gameplay video, the Monk will eventually be able to knock back ranged attacks (a cool ability), but I didn’t even come across any ranged enemies. Timed dungeon. The dungeon is collapsing on you while you’re looting. The health orbs appeared above an enemy’s head while I was killing him, and then, the enemy died and no health orb dropped. Confused. The pants slot is new too for equipment, hurray pants! Also, probably the biggest change that I didn't even realize initially was that all the loot that dropped was specifically for your character, so no scrambling to try and pick up stuff as fast as you could. In fact it'd be better so that you could identify it and then maybe give it to your friends since they wouldn be able to get the item eventually anyway! Rather useful change for a game that pretty much completely revolves around getting random loot.